In 1853, Bishop Anderson appointed the Rev. William Cochrane to establish a missionary station here. Cochrane had previously relocated 25 families from the Red River Settlement to this area in 1851. The original church, known as St. Mary’s La Prairie, was built between 1853 and 1855. It was the first Anglican church west of St. James. Now situated immediately south of the Trans Canada Highway southeast of Portage la Prairie, this cemetery was part of the original grant of River Lot 107, deeded to the Rev. Henry George in 1870. 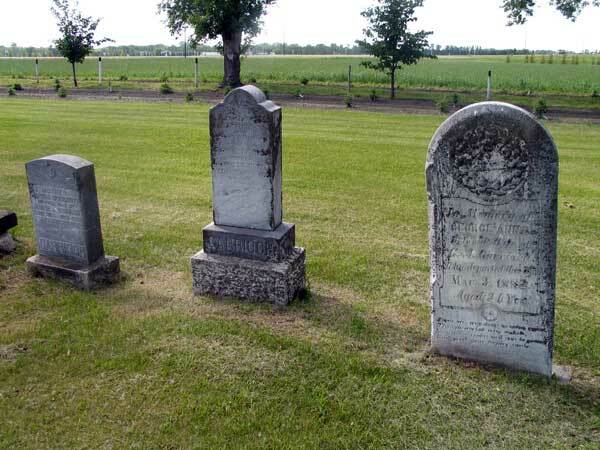 In 1922, the cemetery was taken over by the City of Portage la Prairie, and is presently administered by it.